“Journalist Ellen Rand embedded herself in the front lines of end-of-life care and became a participant in the quest to transform dying. 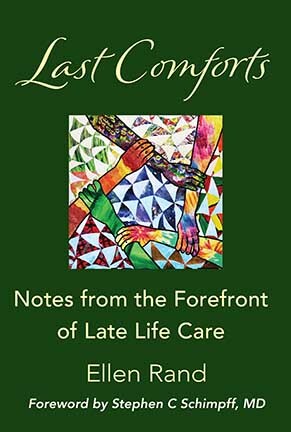 “To anyone perplexed by why so many Americans die badly when so many en­lightened alternatives exist, Last Comforts provides answers and points the way to tangible solutions. “Rand’s investigative skills and wordcraft result in a must‑read book, not only for healthcare and policy wonks, but more importantly, for any adult child bear­ing the weight of parent care. Authoritative and highly readable, Last Comforts is at once sobering and hopeful. “A must read for caregivers, individuals with serious illnesses, their loved ones who care about their care and elected officials. Using the reporter’s skill of interviewing, analyzing and explaining, Ellen Rand tells us what does not work today on our path to death and how the “system” can be changed so that we can die with dignity, in comfort and with those we love around us. “She explains why it is time to “tear down the wall” that separates hospice care from palliative care, the wall that separates those who want to continue treating their illness yet would like to die a natural death and the wall that reimburses for all sorts of medical procedures and tests but not for compassionate discussion. “Healing does not need to equate with cure of disease but rather of a spiritual experience despite the ultimate ending of life. To be a healer requires training just as training is required to do an exam, place a catheter or write a prescription. Physicians are all too often untrained and thus unaware of how to be healers despite their desire and intention to be so. Nurses are better equipped by their training but often are too pulled by bureaucratic requirements to have the time needed to be effective. Still, nurses are at the “heart of caring” and their efforts are the ones that most often transform end of life care to a healing experience. “Rand explains why the nursing assistant in a nursing home, ostensibly at the bottom of the professional totem pole, is the key to good compassionate care and why she needs to have the autonomy to be effective. She explains why there is just too much paperwork necessary in hospice care just as there is in all of health care – taking the caregiver’s time away from the patient. She describes the lack of training of physicians to engage in meaningful listening conversation about medical care in general and end of life care in particular. And the importance of training in palliative care, empathy, interprofessional collaboration and care coordination. “Rand refers to the studies of physicians who consistently state – contrary to how most physicians actually practice – that they would not want aggressive end of life care but rather a care system more akin to that found in hospice and with good palliative care beforehand.